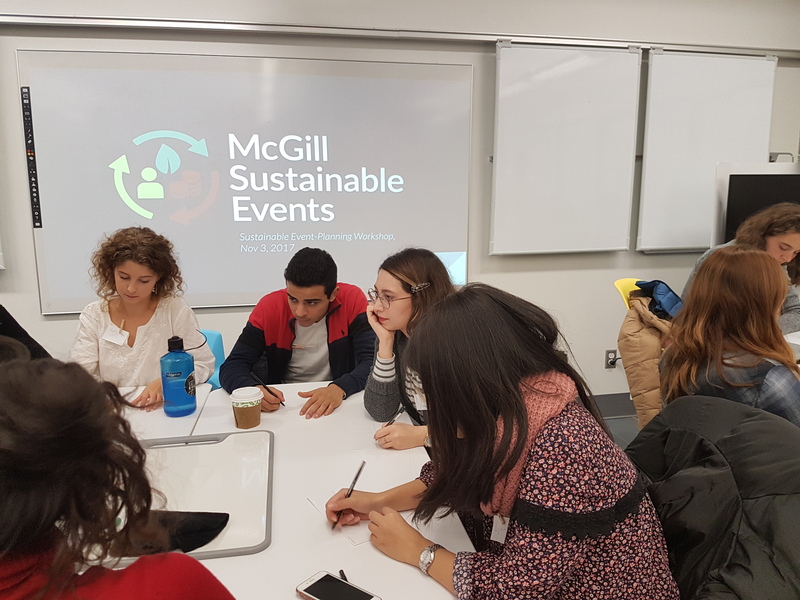 The McGill Sustainable Events Certification Program was launched in September 2017 as a collaboration between staff and students. Each year, thousands of events are hosted at McGill and result in considerable environmental costs. Social sustainability norms are often created at events (e.g. language, preferred pronouns, traditional land acknowledgment). Our program is a positive, voluntary recognition framework which educates & guides event planners to choose more environmentally, socially, and economically sustainable options. 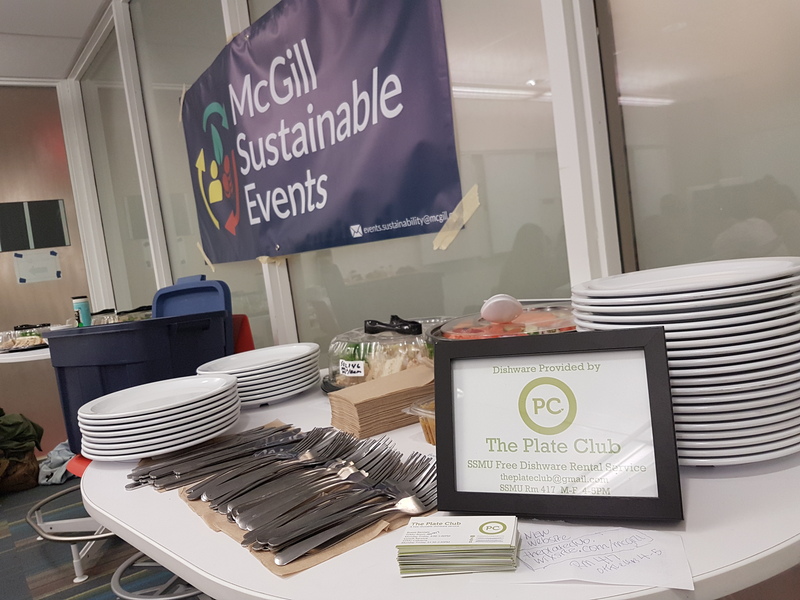 In just 1 year, over 50 events have gone through the event certification process, with a total of nearly 20,000 individuals attending a McGill Sustainable Event. This program's success has hinged on its reliance on student leadership, website, & targeted outreach. Positive change has radiated from event planners throughout campus. McGill University is among the top universities in the world, and hosts over 45,000 students, professors and administrative staff, spread across nearly a hundred buildings in 3 campuses. Such a large population requires physical infrastructure (power, water, waste management) and social infrastructure to promote mental health and cohesion for students and employees. McGill hosts thousands of events per year for the McGill community and external clients. Events range from graduation ceremonies with hundreds of students and parents, donor banquets, case competitions, and team meetings. Events are a key aspect of life at the university: in a student's first few days they attend a week long orientation which sets the culture and social cohesion for their time in school, and clubs spend most of their time organizing social and informational events. However, this large scope leads to a huge environmental impact: events are major sources of ghgs, single use plastics, food waste, etc. 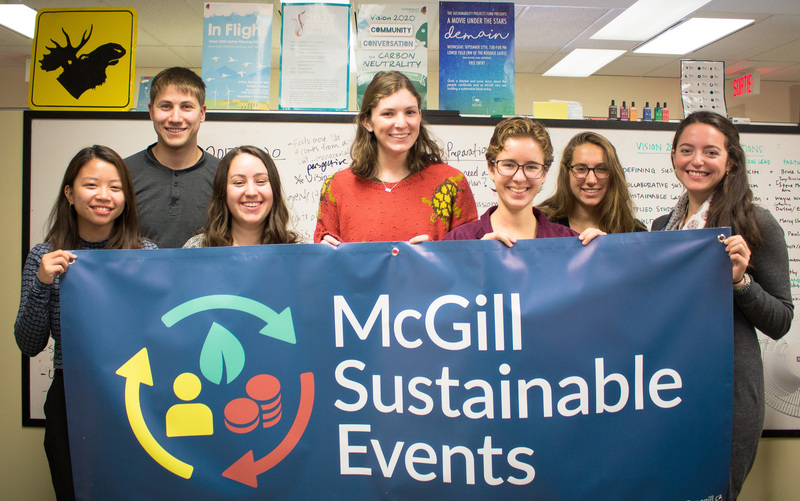 The McGill Sustainable Events program has a two-part certification program: 1. www.McGillSustainableEvents.ca – online toolkit. This interactive platform walks event planners through a sustainable event checklist consisting of 40 concrete actions and resources. This project has evolved from a static pdf checklist to a nice looking platform. 2. Certification: Once the event planner has submitted their event information on the website, a trained volunteer student event consultant is automatically notified and matched with the event planner. The event consultant meets with the planner to explain each action, provide additional resources, answer any questions, calculate the score, and provide follow-up. 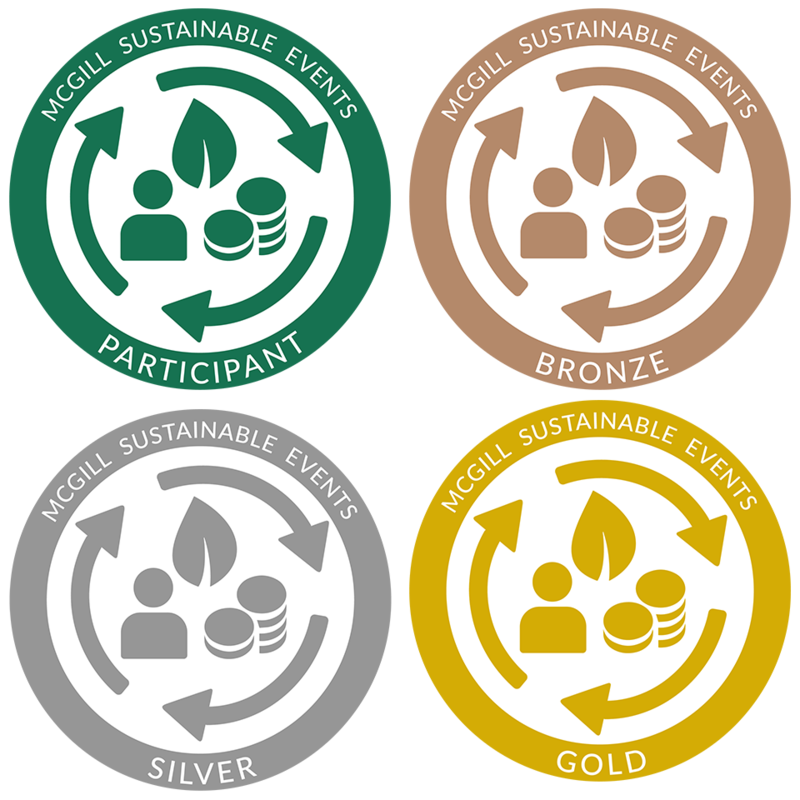 The event can receive one of 4 increasing levels of certification: Participant, Bronze, Silver, and Gold. They are provided a seal of certification and a template to communicate their commitments to the event participants, and their success is publicized on the program’s website. social incentives: provides public recognition to event planners and their events of clear levels of certification, and their efforts are publicly commended on the program's social media choice architecture: by providing points for each action, a planner will work to get points they see as attainable. providing resources including specific lists of caterers, composting removal services, etc eliminates the guesswork and saves time and money. McGill event planners: while developing the materials, we met with event planners to understand their processes, key barriers, and kinds of resources and info would be helpful in various formats. Checklist actions: we met with various stakeholders during the checklist development to make sure the actions were realistic, measurable, and actually priorities. For example, we met with equity groups, procurement, climate expert, student leaders, etc. Social equity: although most of the volunteer event consultants study environmental science, they often lack concrete understanding of how to promote equitable and accessible events. We work with other McGill groups (e.g. Black Students Network, Social & Diversity Office) to receive trainings and learn how to discuss these sensitive and complex issues with event planners. Procurement: We work with external suppliers to show them that there is a demand for more sustainable materials and socially responsible businesses, while following McGill Supplier Code of Conduct. For example, we work with an external composting company to make sure they understand the university's specific needs and invoicing system to reduce administrative barriers. The online toolkit + initial part time coordination received a McGill Sustainability Projects Funding of $8,000. We are a university, so the funding comes from the university's operating budget. The program is supervised by a Sustainability Officer who works for the university, who also coordinates the other engagement programs (sustainable office certification, leadership training, staff gardens etc). There is no cost to event planners to receive the certificate. Initial grant funding for online toolkit + setting up program: $10,000 professional Sustainability Officer supervisor: 5 hrs per week @ $28.00/hr 12 volunteer students who receive co-curricular record recognition: free Website domain name and small marketing materials: $30/year The cost-benefit is very favorable, considering the start-up cost of $10,000 and yearly operational cost of about $1,500.